Introduction: Like many States, South Carolina (SCDOT) has considered the use of structural health monitoring (SHM) technology to improve its bridge management and repair protocols. After some initial research and internal discussion, we determined that judicious use of SHM could enhance our ability to meet several key bridge management objectives, most importantly, safely extending the service life of selected critical bridges and therefore resulting in significant cost savings. This article explains how we saved approximately $700,000 in agency cost for one bridge by using a technically appropriate SHM solution. US 378 over the Great Pee Dee River: This bridge was constructed in 1955 and crosses the Great Pee Dee River in the Pee Dee region of northeastern South Carolina. It is approximately 4,000 feet long and its original design loading was for HS20 vehicles. The main spans of the bridge consist of a continuous steel two (2) girder/floor beam/stringer system with cast-in-place concrete T-beams for the approach spans. The two (2) girder/floor beam/stringer system also classifies the bridge as being “fracture critical”. The bridge has an ADT of approximately 5,100 with 8% trucks and the ADT was projected to almost double over the next twenty (20) years. Significant logging operations and small manufacturing concerns in the local area contribute to the majority of the truck traffic. By some DOT standards, the ADT and truck use were not excessive, but the detour length, if load restricted, would have been approximately 50 miles, resulting in millions of dollars of additional user cost per year. As a State agency that supports economic development, SCDOT is sensitive to this added cost, particularly during our current economic environment, so overly severe load restrictions are a key concern. The Great Pee Dee River Bridge has been inspected using both NBIS visual and tactile protocols since that FHWA program started in the early 1970’s and the CoRe element level protocols since the early to mid 1990’s. In the late 1990’s, the bridge received a Sufficiency Rating below 50 and was classified as Structurally Deficient, which made it eligible for replacement using the FHWA Highway Bridge Program (HBP). However, project programming issues and funding limitations delayed the replacement project letting until November, 2008. Construction on the new bridge began in January, 2009 and was opened in March, 2011. Although weight restrictions were not placed on the existing bridge, the range of visual defects was cause for concern, especially if overloaded trucks used this bridge. SCDOT grew increasingly concerned during the construction planning period and developed a plan for a significant repair program to assure safe operations on the old bridge during construction, allowing legal load trucks to use the bridge without detouring. 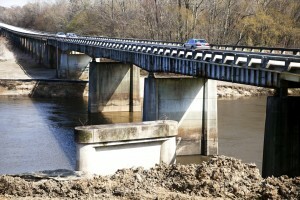 The 2007 inspection was of particular concern, especially considering that the old bridge needed to remain in service while the new one was constructed on a new alignment. From a historical perspective, SCDOT’s other bridges of the same type had problems primarily in the floor beams and stringers due to water leakage at the expansion joints. In this case, the primary concerns were the two (2) main steel girders, since SCDOT had never designed a repair for this type girder design. Several repair schemes were evaluated with an estimated cost averaging about $825,000. While considering the repair alternatives, we determined that a structural health monitoring solution could provide SCDOT with an adequate safety margin for the old bridge while the new one was being constructed. During 2008, we initiated discussions with LifeSpan Technologies of Atlanta, Georgia regarding use of their structural monitoring technology across South Carolina. After thorough investigation of alternative approaches and suppliers, we concluded that LifeSpan offered what we needed: a simple, rugged, reliable, cost-effective SHM solution that provided SCDOT with information that was easy to understand and essential to provide the enhanced safety we were seeking during construction of the new bridge. In addition, the monitoring system hardware was re-usable, which made it even more cost-effective. SCDOT executed a contract with LifeSpan Technologies in January, 2009 and the monitoring system was installed during the spring. Active monitoring was underway for nearly two years, until the new bridge opened in March, 2011. The SHM system hardware was removed from the old bridge immediately after the new bridge was opened and will be re-installed on another bridge with serviceability concerns. An Added Benefit from Our SHM Solution: We learned that a SHM solution can provide the bridge owner with significant information to enhance overall bridge management. For example, captured strain (both tensile and compressive) and temperature data was available 24/7 to our engineering staff over the Internet and we were also able to use hand held smart phones to observe captured data. After several months of data collection, we were able to filter out the observed strains driven by temperature changes, allowing us to evaluate and quantify residual live load strains. This was particularly useful in the Fall of 2010, when we suspected overloaded truck use during the early morning hours. SCDOT alerted the Transport Police, who began monitoring the situation. While the bridge was not load restricted, some detained trucks were overloaded, which created a significant safety hazard on the old bridge while the new one was under construction. When the safety situation was explained to the detained drivers, use of overloaded vehicles on the old bridge decreased. Some drivers even asked how we were able to detect the overloads. Financial Results from the Monitoring Solution: SCDOT saved approximately $700,000 by using a SHM solution versus the alternative of a temporarily repairing the old Great Pee Dee River Bridge. Our return on investment was obviously substantial, which allowed us to redirect savings to critical uses that were not possible if we had to repair the old bridge. In summary, SCDOT has been extremely pleased with the use of SHM technology and intends to aggressively deploy more solutions to better manage our inventory of structurally deficient bridges and to provide performance and preservation monitoring of other high value bridge assets. If we can safely defer only 1 in 3 planned repair or replacement actions, we believe our return on investment will be robust, while reducing local funding demand, enhancing safety and lowering system risk. Have a clear objective in mind when you purchase a SHM solution; there’s simply no reason to consider this exploratory R&D – it works. Don’t overdo the sensor count or even types of sensors; strain (especially peak strain) plus temperature sensors worked fine in this application. Simple, rugged, reliable and easy to understand information should be an essential trait of any SHM solution – downtime for any reason is not an option. Check suppliers and make sure you contract with a firm that has experience, knowledge and commitment; LifeSpan responded immediately the few times we had questions. Aim to achieve a return on investment for each project; re-using the Great Pee Dee River Bridge SHM system will boost SCDOT’s substantial return on investment even higher. Conclusion: Much has been written about SHM these past few years and we know other State DOTs have been hesitant to deploy this technology. We can state unequivocally that our SHM solution and application was technically sound, financially rewarding and clearly enhanced the safe operation of an old bridge that was ending its service life. SCDOT will continue to use this technology in projects or programs where it is expected to provide us with more precise, objective information to support our bridge management program with enhanced safety, lowered risk, safe deferral of repair or replacement projects, possible prevention of some load restrictions, and focus our capital spending with objective clarity.